The great Escoffier described omelette as "scrambled eggs held together in a coagulated skin"
Cooking omelettes requires practice, but they are a staple of the LCHF cuisine so it's worth spending some time practicing! If you have a cast iron omelette pan, so much the better. Heat it and add a little oil and salt which you then rub in carefully (so as not to burn yourself) to prepare or 'seal' the pan. And when you've finished cooking your omelette, it will come out leaving the pan clean so you do not need to wash it; just wipe with a cloth. That being said; non-stick pans are easier, just not as authentic, and I don't get quite the same quick cooking time. Heat the pan with the knob of butter till it has melted. 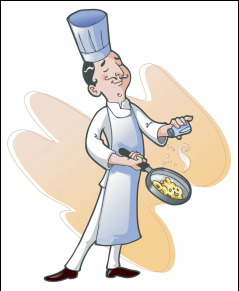 As well as tasting good, the butter serves another purpose - the great Auguste Escoffier described the omelette as "scrambled eggs held together in a coagulated skin". Add the egg mixture and after a few seconds, begin to draw the eggs to the centre of the pan. Go 3-D and tilt the pan so as to get the runny mixture to the corners of the pan. This whole process takes 30 seconds or so. Add your cheese (or alternative ingredients) and wait till it begins to melt. Roll from one side to achieve the typical French omelette shape and serve hot with a few chopped herbs as decoration.